While your D.I.Y pickled jalapeño add a nice amount of pizzaz to a quick plate of melted cheese-topped tortilla chips, when the mood for loaded nachos strikes, there’s pretty much nothing better than a homemade, gluten-free take on Chili’s Classic Nachos. Thicker cut tortilla chips are topped with beans, then queso con chorizo followed by more cheese and finally — after they’re popped in the oven to get all piping hot and melty — a pickled jalapeño slice is arranged atop each chip. Served with pico de gallo, guacamole and sour cream for dipping, this recipe is the epitome of hearty, football season fare. Preheat oven to 350°F. Line a large, rimmed sheet pan with parchment paper. Spread each tortilla chip with a thin layer of beans. Arrange chips in a single layer on sheet pan; set aside. In a small saucepan (2-quart) over medium-low heat, warm oil until shimmering. Add chorizo and cook, stirring occasionally and breaking meat into smaller pieces, until cooked-through and browned in spots. Once chorizo is cooked, sprinkle in millet flour, and cook for about 30 seconds, whisking constantly. Pour in about 1/4 of the milk, whisking rapidly. Once thick and smooth, whisk in another 1/4, heating once more until thick and smooth. Whisk in remaining milk. Bring mixture to rapid, full simmer, and continue to cook until the mixture coats the back of a wooden spoon and when you run your finger through it a distinct track remains. Immediately reduce heat to low (as low as your stove allows) and half of the cheeses (1 ounce EACH of the cheddar and Monterey jack). Stir constantly until cheese is melted; remove from heat. Spoon hot queso evenly over bean-topped chips. Sprinkle remaining cheese (1 ounce EACH of the cheddar and Monterey jack) over top. Place nachos in oven and bake for about 5 minutes or until cheese is nicely melted. 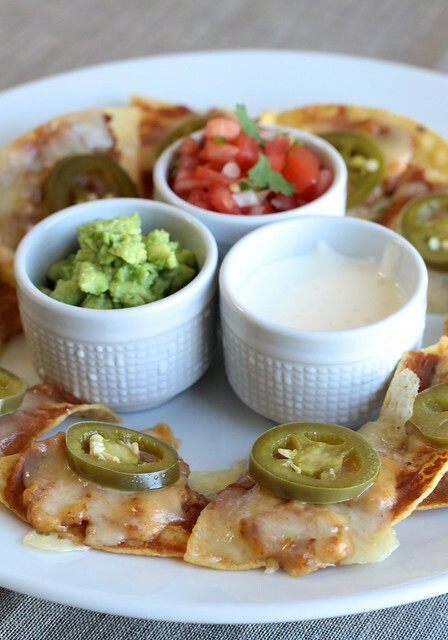 Arrange nachos on serving platter and top each chip with a single jalapeño slice. Serve immediately with pico de gallo, guacamole and sour cream for dipping! ¹ I like the organic variety from Trader Joe’s. I suspect it’s simply a private label of Organic Valley cheese (Monterey jack), but that’s just a hunch based on the similar packaging alone. Mix tomato, jalapeño and onion in a small bowl. Season to taste with lime juice, salt and cilantro. Use immediately or allow flavors to meld for an hour or so at room temperature.